you at just any available job, but rather work hard to find a job that fits your needs and preferences. relationships with our clients and candidates. 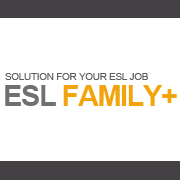 Like the name suggests, ESL Family stays in touch with you throughout your stay in Korea. Start your experience in Korea with ESL Family.